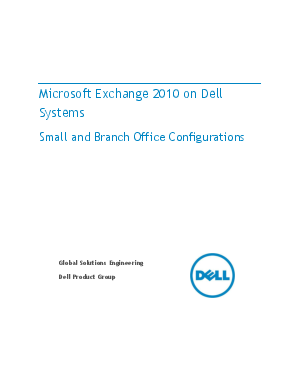 This Microsoft®Exchange 2010 solution architecture manual contains possible configurations that can be used to architect your Exchange 2010 infrastructure. Samples in the manual are intended to serve asa reference or example for organizations whose requirements are similar. Each organization’s requirements can differ significantly, though, and include items not accounted for in these configurations (e.g. message hygiene or third -party archiving). For a configuration sized to your specific requirements, please contact your Dell representative or use the Dell Exchange 2010 Advisor tool at Dell.com/Exchange.